AhnLab’s IT Security Consulting Service is provided by IT security experts, many of whom are Certified Security Professionals (CISSP, CPP) as well as certified IT product specialists. We analyze the security threat factors of businesses and organizations based on AhnLab’s experienced consulting processes to help you improve your IT security status against advanced threats, facilitate compliance, and efficiently reduce information security risk. AhnLab Security Engineering Methodology (ASEM) uses a general and systematic approach for analyzing threats in companies or organizations and establishing solutions accordingly. AhnLab has been designated by the South Korean government as a “Knowledge Information Security Consulting Services Provider” and ASEM is a verified methodology that was awarded for “Software Engineering and Building Technology.” ASEM continues to improve over the years via various projects and consulting experiences. We analyze and evaluate the application system that supports the organization’s core business and tasks and the information infrastructure, and then present an information protection solution that will maintain the stability and reliability of the business. Based on the method of PDSC (Plan-Do-See-Check), we evaluate your security system and current status to provide the best security countermeasures. ASEM modularizes each process of security consulting services so that it can be applied to various environments and delivered with cost-effective results. We set the security level and goal for clients based on our established information security model and present the KPI of the security performance’s effect on the corporation or organization’s business goal or strategy performance. We present an optimal information security countermeasure that has been verified based on a 5-stage scenario that identifies threats which could affect the corporation or organization. The information security standard is intended to help establish and maintain an effective information protection management system. This will increase the credibility of companies. Security control selection in the security management system will also provide continuity and enhance standards in information protection. AhnLab’s consulting services inspect the personal information protection status of corporate systems and departments that deal with personal information and evaluate the managerial, physical and technical protection levels to establish a master plan for information security and to modify or enhance the information protection policy, guidelines and procedures. AhnLab’s consulting professionals use ASEM to establish a systematic personal information protection solution. They also design the physical and technical security architecture for sensitive information, and establish a system to continually enhance and maintain this architecture through a management process. AhnLab’s Security Assessment & Master Planning Group inspects the corporate security management system on the whole and presents a security solution for vulnerable areas. They inspect the client’s security status and issues based on the information security standard and provide an overall guide for security. This group of security professionals uses a checklist and tools based on the international security standard (ISO27001) and other related security standards to assess and evaluate the security standard of the company through interviews, and presents security solutions in terms of priority. With the customer’s consent, AhnLab’s security experts conduct internal and external penetration tests based on AhnLab Penetration Test Methodology (APTM). We search the vulnerabilities of the client’s security systems and present the best countermeasures to prevent both internal and external threats and security incidents. The AhnLab Penetration Test Methodology (APTM) consists of 9 stages to ensure a systematic and x-objective approach. 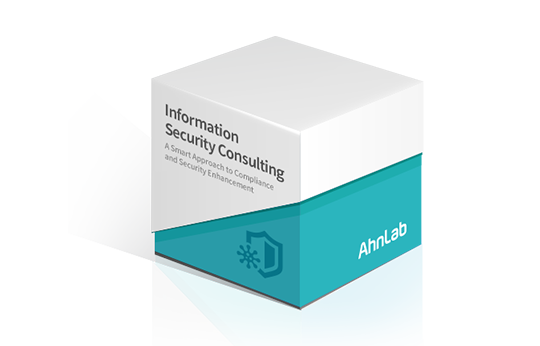 AhnLab’s customizable security consulting service provides dedicated, highly-trained professionals who are capable of responding to quickly-developing security incidents. AhnLab has 20 years of the most advanced technology experience and expertise ranging from computer security to network security, industrial systems security and mobile security, and holds the number one position in the anti-virus market in South Korea. We provide consulting services, customized to each client’s unique needs based on our extensive know-how. AhnLab’s consulting services deliver real business value to our clients by supporting a broad range of security needs, presenting high-quality information protection solutions and enhancing international recognition. AhnLab has been designated by the Korean government as a “Knowledge Information Security Consulting Services Provider,” and ASEM is a verified methodology that has won the “Software Engineering and Building Technology” Award. AhnLab’s IT Security Consulting Service uses ASEM, which has been perfected over the years through various projects, to build a feasible and practical information protection solution. 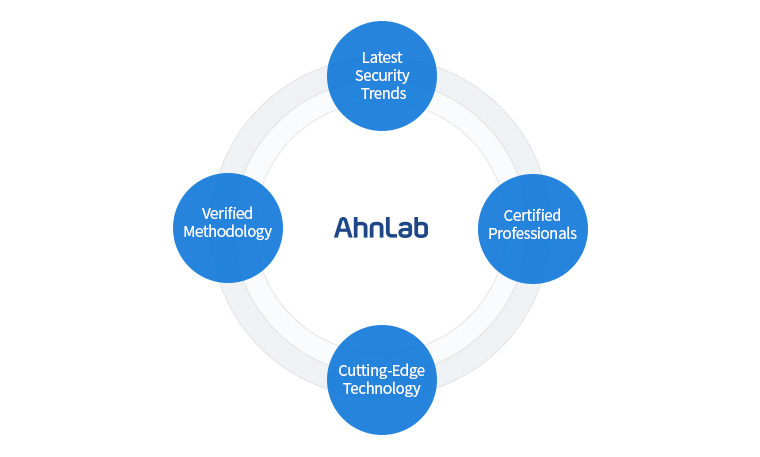 AhnLab’s security professionals, with their extensive consulting experience and expertise, directly participate in building corporate security systems – from designing information protection policies to inspecting various vulnerabilities and conducting mock-hacking tests – to provide consulting services that best satisfy our clients’ needs. AhnLab’s consulting services present solutions that promptly respond to the latest security threats and flow of technology by reflecting malware information from ASEC (AhnLab Security e-Response Center), the biggest malware analysis group in South Korea; intrusion response information from our own CERT (Computer Emergency Response Team); and AhnLab’s endpoint and network protection technologies.